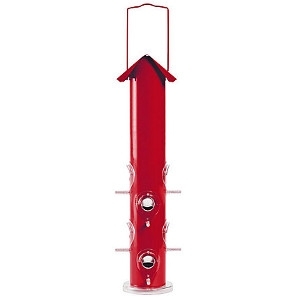 The Red Metal Tube Feeder is easy-to-fill, has removable parts for easy cleaning and is powder-coated for rust resistance. This bird feeder includes a sturdy hanger for secure hanging and a roof to protect the seed from exposure to the weather. This feeder will complement any décor and also makes a great gift! Remember to clean your wild bird feeders every two weeks with a mild soap and water solution.